Last Saturday, bathed in crisp springtime sunshine, Redmond hosted its first city-sanctioned St. Patrick's Day party. The main grid that runs along Fifth and Sixth Street, and traces out a Norman Rockwell-quaint downtown, was bustling with residents young and less young. Several men in kilts wandered on the street, presumably members of the High Desert Celtic Society, a group that had performed earlier in the day. At the hub of the event, the recently renovated Centennial Park, three white tents flapped gently in the wind, a warm breeze carrying the intoxicating smells of barbecued pork and cotton candy. At the north corner of the park, children rode miniature ponies. In the decade after the turn of the 21st century, like most of Central Oregon, Redmond boomed, its population nearly doubling to the current 26,000 residents. But, unlike Bend, which underwent a philosophical shift in attitude and lifestyles, Redmond remained fastened to its blue-collar roots—and, along with that, some deep-seated problems with high unemployment, low-wage jobs, poor high school graduation rates and wide-reaching meth and heroin use. But, over the past five years, in a very deliberate and forward-reaching manner, city officials and entrepreneurs in Redmond have steadily grown its infrastructure and planted seeds for major economic growth. The first step in this journey started several years ago, when a bypass for Hwy 97 was laid down, and bowed highway traffic, like the giant 16-wheelers that once rumbled through Redmond, away from the downtown area—the very space occupied last weekend by families celebrating St Patrick's Day, and filled with new restaurants and coffeeshops. 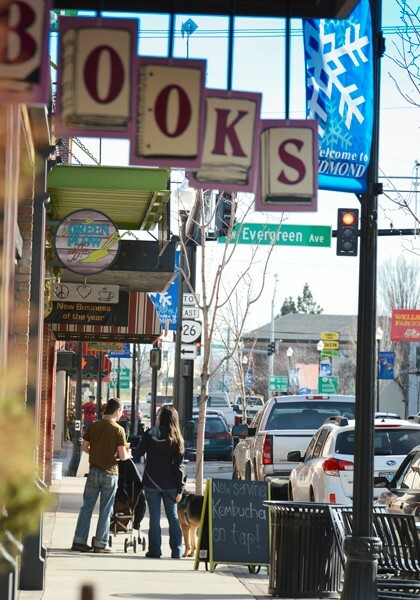 That first step opened up the downtown area to an entirely new attitude and opportunity, and, in the process, also opened the question: Could Redmond be the next "It" town, an All-American city, bustling with thriving businesses and fostering high-quality lifestyles. And, perhaps as important to the residents and city planners, can it hold on to its soul while undergoing a transformation? 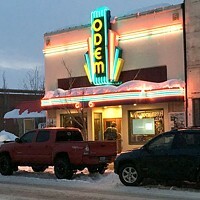 During the lowest point of the recession, in 2010, when Bend was struggling with a collapsing real estate market, a shrinking tax base and soaring unemployment, Redmond started to make motions toward a revitalization, a bold move that was part small-town moxie and part forward-thinking leverage of federal grants. Perhaps the most visible and immediate change after Hwy 97 was diverted away from the historical downtown area was Centennial Park, a grassy city block adjacent to City Hall and a block from the main library. With water spouts and jets, and blankets of green grass, it is a friendly, relaxed open space. On Tuesday summer evenings, it is host to the modest Redmond Farmers Market. That same year, in 2010, Hutch's Bicycles opened a shop in Redmond, and a year ago, the popular bike store moved next door to the flagship Cascade Lakes brewpub. Hutch's has six Oregon locations, but sales manager John Frey explains that the Redmond store is seeing remarkable growth. "That store has the most potential of all of our stores." Fry notes that he has noticed more people than ever walking through their doors—a testimony for the changing lifestyles within Redmond, and also about a blooming cycling culture there, with trails being developed outside Prineville and near Tumalo—both closer to Redmond than Bend—and, most notable, Radlands, a series of trails through a juniper forest just northeast of Redmond that opened three years ago. "What's crazy," says Fry, "is the road riding out of Redmond is even better than in Bend." He explains further, "you get a lot more Cascade views out there." Fry pauses before adding, "the road riding is awesome." Business in Redmond is not necessarily booming, but it is growing. 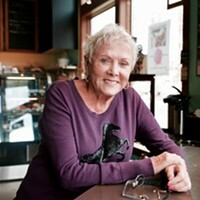 The consensus of new and old business owners in the area is that the City of Redmond is remarkably easy to work with, and incredibly business-friendly; business-owners use words like "partner" to describe their working relationship with the City of Redmond to build up the downtown area. In November, Deschutes County voters approved a room tax on hotels and rentals outside of Bend. Specifically, that additional revenue will fund greater marketing efforts for the Expo Center on Redmond's eastern reaches. Currently, the Expo Center only hosts events about half of the available time—and the promise of additional events and concerts also holds the idea that tourism dollars could double in the next several years. But already, the improvements in Redmond—both of business and livability—are evident. A few blocks west from City Hall and Centennial Park, another city park, Sam Johnson Park, will soon receive a $1 million facelift, including splash parks and state-of-the-art, accessible playgrounds. What is especially encouraging is that a respectable portion of the renovation is supported and has been driven by concerned—and proud—Redmond residents. To the east of City Hall, roughly running parallel to Hwy 97, Fifth, Sixth and Seventh Streets sketch out a grid pattern that is looking more and more like Mayberry each month, and less like the stretch of big box stores, motels and fast food restaurants that so many who simply bypass Redmond on Hwy 97 associate with the city. Last year, the City poured civic funds into improving the primary commercial stretch of Sixth Street, with wider parking lots, on-street parking, bricked pavers, and flower baskets; the result is a charming, low-key Main Street, U.S.A. ambiance. "It all ties into a better feel downtown," explains Dan Mooney, Marketing Director for the Redmond Chamber of Commerce. "It seems more walking friendly; it has a more downtown feel." New cafes have opened, including a vegan and health food-focused Bliss Bakery last year and, next door to that, Red Martini Wine Bar & Grill, a sophisticated and warm bistro that opened just before New Year's Eve. That restaurant sits on the first floor of the currently defunct Redmond Hotel, but which city planners have recently shown to developers with plans to reopen the classic 1927 building, complete with a rooftop deck. "We don't have to go to Bend to eat anymore," declares Mooney. "Downtown is kind of hopping right now." This enthusiasm and development on Sixth Avenue also is spilling over to nearby streets; in particular, Fifth Street is getting caught up in the momentum. In the next few weeks, with fire engine red awnings and wide roll-top garage doors, Wild Ride Brewing will open a spacious 8,650-square-foot facility on Redmond's northern reaches. Housed in a former Parr Lumber warehouse that had sat vacant for four previous years, and with a 20-barrel brewing system and a 1,000-square-foot tasting room and patio, this is a major addition to the city's—and region's—brewery scene. Paul Bergeman, partner and brewmaster, previously worked for Hawaii's Kona Brewing Co. and Portland's popular neighborhood brewpub Laurelhurst before that. Co-owner Brian Mitchell is one of six owners to grow up in Redmond, a 1994 graduate of Redmond High. He calls it "hometown pride," adding, "we saw an opportunity in Redmond and outside of Bend in particular." "We're excited for the revitalization of the downtown area," he explains. "It gives people a reason to stay here in downtown Redmond." 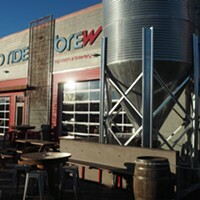 The addition of Wild Ride brings the count to six breweries in Redmond, including the flagship Cascade Lakes Brewery; already in 2014, two breweries have opened. "No one wants 'Redmond' and 'potential' to be in the same sentence any more," explains City Manager Keith Witcosky. "We want to move forward." Before taking the city manager job last July, Witcosky worked for the past 15 years in Portland with the Portland Development Commission, overseeing intergovernmental relationships and negotiating that city's urban renewal plans during a period of time when Portland saw massive growth. As if discussing a fixer-upper house in a great neighborhood, the 40-something talks about Redmond's "great bones" and "quaint charm." This summer, Witcosky hopes to move City Hall from its current location—a 1940 art deco building that housed a Safeway for decades—a few blocks away, and in the process open that space for a civic center, including family-friendly spaces and a movie theater. Witcosky assures that the greater challenge is not whether Redmond has an opportunity to build a bustling downtown and shore up the city's economy, but how it moves forward. "How Redmond attracts investment from outside, yet stays true to the character of the place," says Witcosky, is a keen challenge. He talks about taking deliberate steps, and what he has learned from Portland, which during his time experienced both enormous rejuvenation, but also murmurings that the economic growth was coming at the expense of lower income families, as housing prices elbowed residents from traditional working class neighborhoods in North and Northeast Portland. Witcosky and city council are working to make sure that development happens hand-in-hand with maintaining Redmond's small-town charm, style and longtime residents. Last year, for example, the city attracted BasX Solutions, a company that primarily manufacturers medical "clean station" modules and will employ 150 workers. Symbolically, the manufacturing company takes over a former Wal-Mart location, replacing an outlet that paid low-wages and drained corporate profits to its Arkansas headquarters. Within city limits and elsewhere, Redmond is steadily gaining a reputation for being business-friendly, and working with companies to assure their success. But Witcosky quickly points out that business-friendly "is not that we're desperate and just need a friend." "We need to do what's right for Redmond," he concludes.